Pork chops and applesauce (I bet you said that in your head like Peter Brady. And you’re welcome). I’ve always loved it – pork and any fruit, really. 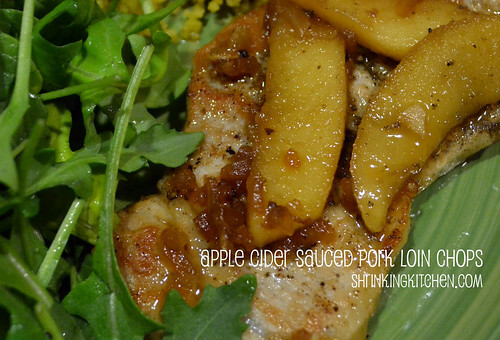 I’ve had a yen to do a pork and fruit recipe and was toying around with different ideas. Apricots? Plums? Mango? All had potential, but I kept coming back to Peter Brady and his damn pork chopsh and applesaush. So this is it…my grown up version. Lightened up and super delish. I these pork loin chops over curried couscous with a side of arugula tossed in lemon and olive oil. Heat a non stick skillet over medium high heat. Add olive oil. Rub the chops with sage, season with salt and pepper. Place the chops in the hot skillet. Cook for about two minutes on each side, remove from pan. Add the apple juice and vinegar to the pan and deglaze, scraping up all the yummy brown bits with a wooden spoon. Whisk in the onions, syrup and Worchestershire, then add the apples to the skillet. Allow the apples to cook and the sauce to reduce for a few minutes. Add the chops back to the pan and cook a few minutes more, till the pork is cooked. DO NOT OVERCOOK YOUR PORK. It just needs to be a minimum of 145F. Believe me. Overcooked pork is why a lot of people have a pork chop aversion. Let's kill the stigma, okay? Serve with starch of your choice - couscous, quinoa, good old rice. Just make sure you get every last drop of the delicious sauce! Yay! I just recently read a great article about pork and not overcooking! Can’t wait to try this!